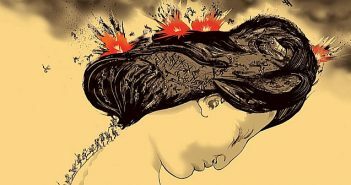 Red Rosa is wonderfully composed and tells a story that is compelling, inspirational and fundamentally human. 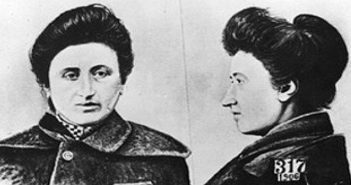 The first time I heard the name Rosa Luxemburg was when I was in high school. I was standing in the Opernplatz in front of Frankfurt am Main’s bombed-out Opernhaus listening to a speaker lambaste the US bombing of northern Vietnam and the mining of its harbors in May 1972. My understanding of the German language wasn’t the best, but, if I listened closely (and stayed near one of my bilingual friends to translate those phrases I didn’t quite catch) I made sense of most political speeches. As I looked around at the sea of red flags and thousands of mostly young Germans in military fatigue jackets and bellbottom jeans, I heard her name shouted from the podium. I don’t recall the reference or much else from the speech because immediately afterwards, we began marching. It was a rather eventful protest, with the police opening their water cannons several times along the route and us marchers blocking streetcars and traffic in response; which natural gave the police another opportunity to use their water cannons. 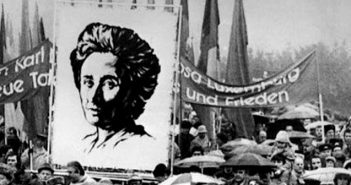 Luxemburg was not only one of the few women prominent in the socialist movement of the twentieth century. She remains one of its most inventive and radical theoreticians. Her works on imperialism, credit, the role of the strike, and imperial war are both relevant and prescient in their application of Marxist economic theory and capitalist war. Indeed, her discussion of credit under monopoly capitalism is essential reading for anyone who wants to understand why the capitalist economy crashed in 2007-2008 and why it will crash again. Her unrelenting opposition to imperial war and disgust with those who call themselves socialist yet support such wars is an inspiration to those of us who find ourselves in a similar situation today. Most importantly, her commitment to revolutionary struggle and a personal freedom unknown to most women of her time (and to many if not most women today) is an inspiration. Her life is an inspiration in itself. That is the message one gathers while reading the recently released biography, Red Rosa. Composed as a graphic “novel”—what I still call a comic book—this work is a reasonably complete introduction to Luxemburg’s life and works. It is also a historical overview of the times she lived and worked in. The excellent artwork is accompanied by a slightly fictionalized narrative (think poetic license) portraying this revolutionary’s life, loves, fears and joys. The creator, Kate Evans, provides enough political and historical context to paint a narrative that shows Luxemburg to be a woman both of her time and ahead of her time. One discovers the trails she blazed in her personal life complemented those she forged in the world of revolutionary socialism. This was a time when women were not expected to take on the roles Luxemburg insisted on. The force of her thought and the relentlessness of her political being demanded that otherwise dismissive men both in opposition and solidarity consider her presence. 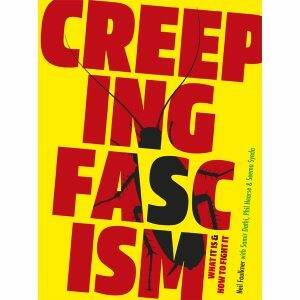 The notes and commentary provided by Evans and her editor Paul Buhle are both a useful addition to the graphics and text and a means to an even fuller understanding of Luxemburg’s life, thought and times. 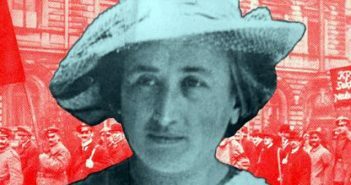 On September 16, 1913 Luxemburg gave one of her most famous antiwar speeches in Frankfurt. In that speech she called on Germans to refuse to fight and was arrested for the speech’s content. In the winter of 1914 she was sentenced to a year in prison. Riots against the sentence broke out in several cities across Germany. Nowadays, a road built in the 1990s named Rosa Luxemburg Landstrasse runs through part of Frankfurt am Main, apparently with little or no irony intended on the part of the authorities (to its credit, Frankfurt has been governed by a mostly left-leaning council for several decades.) Given the fact that Germany has sent troops to various regions under the NATO banner in recent years, I wonder how Luxemburg’s antiwar sentiments would be received in 2015. Also, given that Luxemburg and her fellow revolutionary Karl Liebknecht were murdered by the predecessors of at least one of the political formations who named that street (the Sozialdemokratische Partei Deutschland -SPD), I also can’t help wondering if she would reject what was certainly meant to be an honor. Red Rosa is a wonderfully composed and lively book. The story it tells is compelling, inspirational and fundamentally human. Instructional in its politics and discussions of economics, Red Rosa is also at turns humorous, romantic, and emotional. 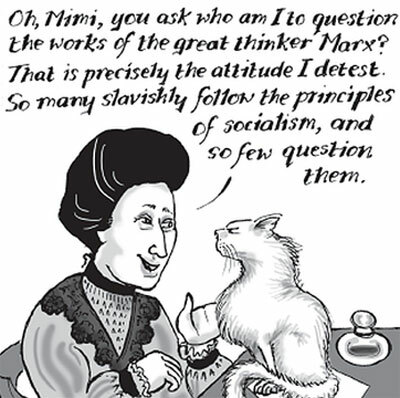 The decision to write this work in the graphic novel form was a brilliant one; if there is a biography whose multiple dimensions requires more than words to tell it, Rosa Luxemburg’s is such a biography. 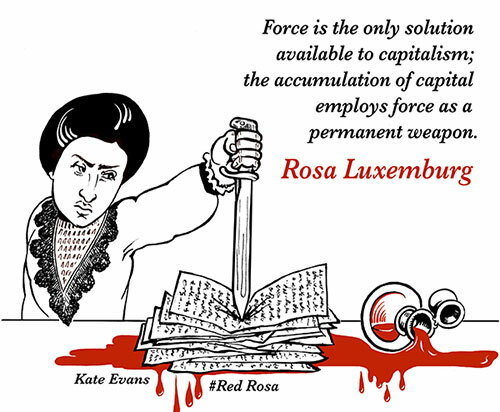 Illustration from Red Rosa: A Graphic Biography of Rosa Luxemburg by Kate Evans. 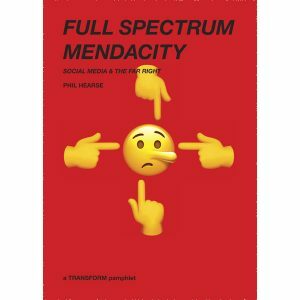 Published by Verso. 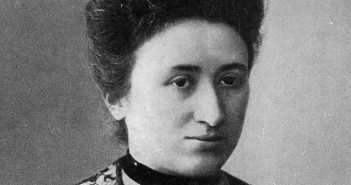 Rosa Luxemburg, murdered 15 January 1919: I was, I am, I shall be!